This book undertakes a critique of the pervasive notion that human beings are separate from and elevated above the nonhuman world and explores its role in the constitution of modernity. The book presents a socio-material analysis of the British milk industry in the late nineteenth and early twentieth centuries. It traces the dramatic development of the milk trade from a cottage industry into a modernised and integrated system of production and distribution, examining the social, economic and political factors underpinning this transformation, and also highlighting the important roles played by various nonhumans, such as microbes, refrigeration technologies, diseases, and even cows themselves. Milk as a substance posed deep social and material problems for modernity, being hard to transport and keep fresh as well as a highly fertile environment for the growth of bacteria and the transmission of diseases such as tuberculosis from cows to humans. Milk, Modernity and the Making of the Human demonstrates how the resulting insecurities and dilemmas posed a threat to the nature/culture divide as milk consumption grew along with urbanization, and had therefore to be managed by emergent forms of scientific and sanitary knowledge and expertise. Milk, Modernity and the Making of the Human is an ideal volume for any researcher interested in the hybrid socio-material, economic and political factors underpinning the transformation of the milk industry. 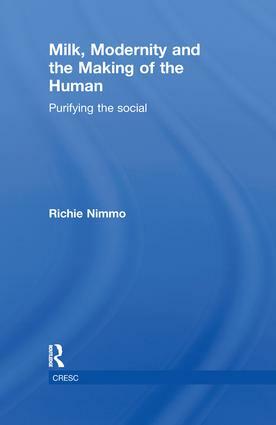 Dr. Richie Nimmo is a Lecturer in Sociology at the University of Manchester, UK. His research explores the ambiguous status of nonhumans in modern knowledge-practices and the constitution of ‘the social’ across materially heterogeneous relations, systems and flows.